Traditional hummus made with chickpeas, tahini, lemon juice, garlic and olive oil is always fire. But why not add in roasted carrots for extra flavor, a pop of color and a healthy dose of beta-carotene? 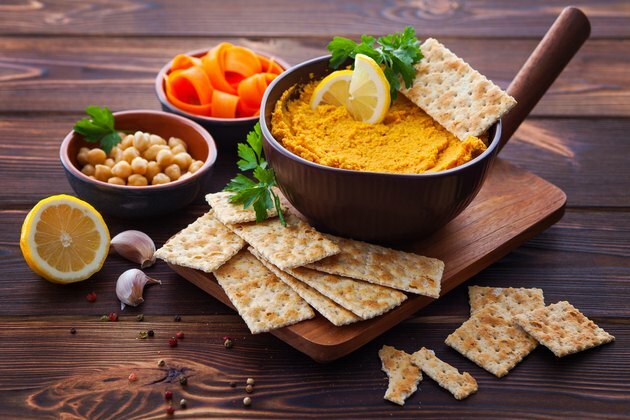 Roasted carrots are the base of this velvety, orange-hued hummus, which contains just 185 calories per 1/3 cup serving, 15 grams of heart-healthy fat from olive oil, as well as fiber thanks to the chickpeas and carrots. As far as healthy work snacks go, hummus is king. Take a container of this gorgeous hummus with you to the office, along with a bag of celery, cucumber, Vitamin A and C-rich red bell peppers and boiled eggs for dipping. For more DIY hummus that's as beautiful as it is delicious, whip up this beet-based hummus recipe. Craving a smoky hummus with a kick? Try this fiery chipotle version. How Many Calories Are in Spinach Dip?